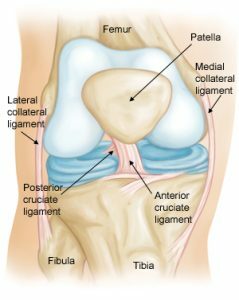 If you have ever played or watched any field or court sport, you know that anterior cruciate ligament (ACL) injuries are unfortunately commonplace. In a top tier league, like the English Premier League, where the average salary in the 2014-2015 season was $3.3 million or the NBA where the 2015-2016 average and median salaries are $4 million and $1.9 million respectively, an ACL injury can cause a significant impact to the team’s checkbook. This is compounded with the absence of play for anywhere between 6 and 8 months for a complete ACL rupture recovery, making it a devastating injury for any athlete or team. There has been significant research done on the many different hypotheses regarding the contributing factors to both contact and non-contact ACL injuries. Some theories are more founded than others based on the research to date while others still require more insight. In this discussion, we will focus on those relating to non-contact injuries because a significant portion of ACL injuries are non-contact injuries. As mentioned before, both field and court sports have a higher occurrence of ACL injuries because they involve change of direction or cutting maneuvers combined with deceleration, landing from a jump in or near full extension and pivoting with the knee near full extension and a planted foot (Alentorn-Geli, et al). All of these situations involve some degree of knee valgus, varus, internal/external rotation moments and anterior translation force. A player will most likely experience some variation or degree of these maneuvers during every trip down the field or court and these movements will occur hundreds of times during a game or practice. There are many other risk factors that can contribute to the mechanisms above and can include joint laxity, ACL size and strength and relative strength between the quadriceps and hamstring recruitment. As you can see, the mechanism and factors affecting/causing each injury can be difficult to pinpoint and wide ranging to the point that it would be impractical to try and address all of them. In turn, the best approach is to address what is within your control and in this case, that is the mechanisms of injury. Our overall goal is to induce a positive neuromuscular adaptation that allows one to execute these movements safely, at game speed, allowing the athletes to perform at their highest level.The three aspects of training that have shown to reduce ACL injury rates when prescribed correctly are: proper biomechanics and body awareness, plyometric training and strength training (Hewett et al). While change of direction, deceleration, landing from a jump and pivoting are necessary and vital movements in sport, proper mechanics and techniques are just as important to teach and reinforce as shooting and dribbling. Whether it is teaching an athlete to land with knees slightly bent in an athletic quarter squat position or jumping from a position in which the knees track over the toes, having proper biomechanical movements and body awareness are key to executing these athletic movements safely and properly. Incorporating plyometric training has also been shown to lower the risk and occurrence of ACL injuries. Utilizing the stretch-shortening cycle in plyometrics allows the athlete to train muscles, tendons and connective tissues and the central nervous system with proper technique. This helps to build the dynamic stability about the knee as movements are performed. Plyometrics should be prescribed 1-3xs per week at a volume and intensity commensurate with the team’s training cycle (work:rest ratio and total ground contacts). A proper strength training program is the last piece of this puzzle and the glue that holds it all together. Without the requisite strength, an athlete may not even be able to properly perform the biomechanical movements required and in turn, would not be ready for the integration of a plyometric program. A proper strength training program is the foundation that all neuromuscular adaptation and injury prevention is built upon. While the mechanisms, risk factors and prevention of ACL injuries is complicated and complex, from a generalized standpoint, the mechanisms and means of prevention can be addressed with proper biomechanics, plyometrics and strength training. All three aspects can be compatible and complementary when integrated into a proper training program and in the end, potentially reduce the risk for ACL injuries.